The former location of the "Spiral Staircase House". Thanks Ken. Thank you Ken - I have not seen any good photos of the old Spiral Stairace site in my internet travels. 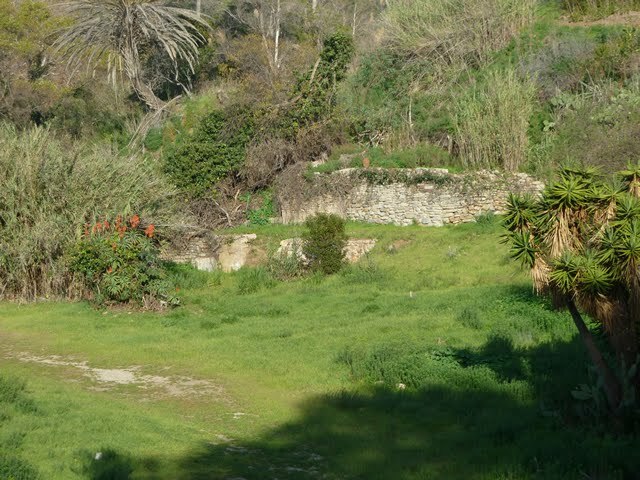 Is that the foundation that is still visible through the weeds? I remember reading somewhere that a creek ran through the bottom half of the house. Hard to tell from the photos if there's still water. if anyone out there has any interesting tidbits of information about the spiral staircase house please let it be known. i have a feeling-no proof-that Jay Sebring may have met manson and atkins at this place. plus it is just plain interesting but there is not a lot of information out there. thanks. Patty - Those are stone retaining walls. 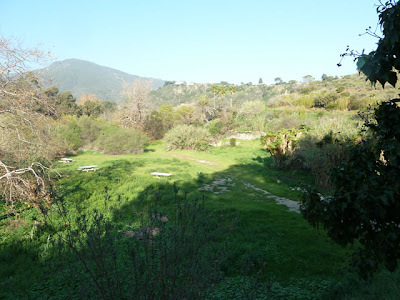 There is a creek that runs through the lower Topanga area. It floods when the rains are heavy. This would explain why the house had slipped of it's foundation. It is said that the first floor was full of sand and it was the second story that was occupied. beauders - I've spent a lot of time trying to find info on The Spiral Staircase. There isn't a whole lot. I have learned that some of the stuff that has been written on the Manson websites is false. 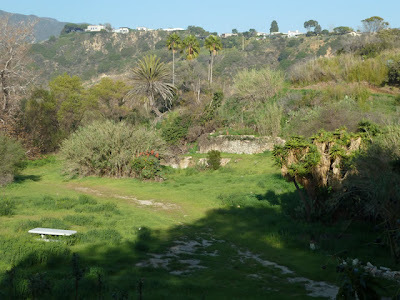 There is stuff that has been written by people that lived in the lower Topanga area and right across the across the highway at Topanga Beach. One of these guys wrote that he lived there when he was four, across the street from the Manson Family. In the early 1900's someone in the Hearst family (Hearst Castle) liked the area and built a two-story getaway home there. I believe this home may of been what became The Spiral Staircase. This Hearst person would have rodeos there. All the early Hollywood cowboys would come, Tom Mix and so on. This helped give the area it's first nickname which was "The Rodeo Grounds". Topanga Beach is directly across the street from this area. At some point in time there were houses, bungalows and huts built right on the Topanga Beach. This could of been in the 40's and 50's. I'm sure some surfer huts were built later than this. They filmed surfer movies there in the early 60's like "Muscle Beach Party". Topanga Beach had became a pretty wild party beach in the later 60's. If the people that lived on the beach at this period actually owned the homes on the beach or were just squatting, I don't know. There were drifters, squatters, moochers, surfers, hippies, slippies, etc,etc...I'm sure this overflowed across the street into what had now become known as "The Snake Pit". The homes were torn down in the eighties. I've read on some of the Manson websites that the house was called "The Snake Pit" prior to being called "The Spiral Staircase", this is false. The area that was known as "The Rodeo Grounds" is what became called "The Snake Pit". This was do to the fact that there were Rattle Snakes all over the place. I know that it is said that the name came from the type of people that lived there, but I don't think so. I read things that have been written by these guys that lived there and it seems they are trying to hold on to some kind of glory through it by applying it to themselves. The "legend in their own mind" kinda people. There is more to write but it's 1:30 am and I have to get up in 4 hrs. I've got more pics of the Topanga area to send to Lovely Liz still. I'm going back up there this weekend and I'll have more next week. I'll also be getting good pics of the house where Zero killed himself in Venice. A Hearst connection! Wow. Thank you, Ken. thank you for these. ..on my way down there on the 14th. i also wanted to see the ardmore temple. found old pics on a bikers site irish rich..and pics of the condo there now. now i know what is left of the staircase house. everyone who lived there. They were finally evicted by the sheriff's department after not paying rent for over a year. They came back a month later and burned the house to the ground. They were all total scumbags who didn't belong in such a peaceful neighborhood.